down first? Here’s one way to order it. Sidewalk priority: A new rule in Seattle would make sidewalk removal during construction projects a last resort. Guerrilla parking spaces: Police in Brooklyn painted parking space numbers right on top of a bike lane. Streetcar track fatality: A man riding a bike on San Francisco’s Market Street was killed by a bus, apparently after catching a wheel in the track while biking in a streetcar lane and falling sideways. Helmet laws: The lackluster first year of Seattle bike share is the latest sign that helmet mandates seem to reduce biking, reports the WSJ. Drunk driving: A 23-year-old Florida woman streamed a video of herself driving drunk live on the Internet, including a statement that she was drunk. People watching the video online spotted local landmarks in the background and helped police track her down and arrest her. “Reckless conduct”: A man who knocked on the door of a lane-drifting SUV while biking in Chicago wound up in handcuffs; the SUV’s driver was an off-duty cop. E-bike share: Birmingham, Ala., has the country’s first bike share system with electric pedal assist. Church vs. bike lane: A D.C. church says removing parking on its street for a protected bike lane would violate its members’ constitutional right to religious freedom. Boring biking: Dan Savage visited Europe and concluded that if we actually built protected bike lanes in the States, most of today’s riders would actually hate it. All-bike building: An 86-unit apartment building and motel in Malmo, Sweden, will be built with only car-free biking tenants in mind. Theft guides: Strava-style routefinding apps may be contributing to bike theft, police in the UK fear. Trains and bikes: Even as Amtrak improves its roll-on bike transport, the train that links France and England through the Chunnel is about to start forcing people to dismantle their bikes. 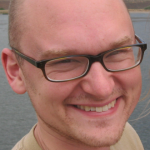 Seattle levy: Ballots are out in Seattle’s transportation property tax request. The average city home would pay $279 a year, with at least 41 percent going to maintenance. Bike wedding: Our compatriot Tom Fucoloro of Seattle Bike Blog got married by a bike trip and has a lovely account of it. Racial profiling: A study of eight U.S. counties found that red-light cameras didn’t differ from police in the share of people they charged for red-light running who were black. Bike lift: North Vancouver, B.C., is considering a bike lift to tow people uphill, just like the one in Trondheim, Norway. Commuting nightmare: It might be cheaper to commute by plane from Las Vegas than to live and work in San Francisco. Self-driving cars: Tesla’s newly active Autopilot feature lets all its cars steer, change lanes, brake and parallel park on command. 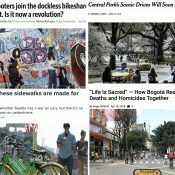 — If you come across a noteworthy story, send it in via email, Tweet @bikeportland, or whatever else and we’ll consider adding it to next Monday’s roundup. That arrest in Chicago for knocking on a car that was drifting into the bike lane makes my blood boil. Talk about no merit and police abuse of authority…the cyclist was an attorney and I hope he makes a rigorous defense of his rights. Wow. I hope the off-duty cop also writes himself a ticket for driving in the bike lane. Aggressive, sloppy driving, shouting “I’m a f* cop” at a lawyer… lol, hope that will be the end of that. You know what’s really threatening? A multi-ton vehicle encroaching on my designated space while I’m actively using it. I hope the cop gets ticketed in the end. Just. Wow. My thoughts exactly – driving a car into your lane is the really threatening gesture/behavior. Having said that, I have taken to yelling “LANE!” as loud as I can if I think something like this is about to happen. It seems to work. Better to let them know you’re there before they start wandering than to bang on their car once they’re on their way to flattening you. If you haven’t given this a try, I also recommend it. Whenever someone is about to invade my lane I just yell ‘HEY’ at the top of my lungs (it doesn’t really matter what word you yell, the point is to instantly get their attention) and most of the time they react favorably and cease invading the bike lane. About 5% of the time it doesn’t work, so still be prepared to stop and/or avoid them. I had an airzound, but my HEY! is louder and hands-free. I do sometimes forget that cars are a sealed bubble and I’ll say “what are you doing?” in my indoor voice before I remember that I have to yell through the glass and over the radio. This has been my experience too – lungs quicker than thumbs! (The zounds is on my friend’s boat now). I once politely asked a driver if they were OK or if they needed medical attention. They were texting, not surprisingly, but they said “why do you ask?”. I replied that they were weaving in and out of their lane and that if I was ‘on duty’ I might even suspect they’re under the influence. Of course I never actually said I was a police officer, but phrasing it in that manner certainly got their attention. It’s just a bad idea to ever touch someone’s car unless it’s about to hit you. One thing we cyclists sometimes forget about CarHead is that it makes most drivers think of their car as an extension of their bodies. So while rational people think of a motor vehicle as a mere piece of property, most drivers would consider a slap on their door the same as physical assault on their person. And will (over)react accordingly. Here’s my firsthand anecdote of this: Many years ago I smacked a car with my hand, much like Mr. Liu did, for blocking a bike lane and forcing me to stop while I waited for traffic in the adjacent travel lanes to clear. This quickly escalated into a physical attack on both my person and my bike, a police response, and gathering of sympathetic/shocked witnesses. I wasn’t hurt, my bike sustained only $15 in damage, and I may even have taught the driver a lesson. But still, the lesson *I* took home was that it was Not Worth It. One really important dimension of this lesson is that by being the one to initiate physical contact (even though it was against a car), I made it nearly impossible to charge the other guy with assault. If the guy had done me any serious damage, it would have been difficult to send him off to jail — AND difficult for me to recoup any damages. So I ever more firmly believe in the Sticks and Stones approach: yell all you want at offending drivers, but do not touch (except to actually defend yourself). That said, the above is only my defensive-riding advice, and I still do not think there was anything *wrong* with what Mr. Liu did. He is the victim here, and is certainly not guilty of disorderly conduct or anything else. I don’t know if an off-duty cop making an arrest is considered to be making a citizen’s arrest, and thus subject to the same legal risks and pitfalls, but since he appears to have failed to follow proper procedures he may be open to some sort of civil and/or criminal penalties. I hope that Mr. Liu is able to pursue something against him, in addition to getting the charges against himself dismissed. It is very fortunate for him that he’s got witnesses to back up his version of events, something that is pretty rare for cyclists in driver-vs-rider incidents. “A person is justified in using physical force, other than deadly physical force, upon another person when and to the extent that the person reasonably believes it to be necessary to prevent or terminate the commission or attempted commission by the other person of theft or criminal mischief of property.” ORS 161.229. You don’t even have to argue reasonable belief. Objectively it’s impossible to claim that such assault is to prevent or terminate damage to his property. Your slap already occurred, and the ability to drive away means it’s not necessary to assault you. I’m not advocating the car slap (although I sometimes am unable to restrain myself)–just saying. You’re right that in terms of the written law it doesn’t make much difference who initiated physical contact. But that’s not what matters. One thing I’ve learned in my occasional experiences with the legal system is the only thing that matters is how it looks to a jury. No matter that only a small percentage of cases ever go to trial, but EVERY case’s outcome is heavily influenced by what a jury WOULD think. And by initiating physical contact I gave myself a very big hill to climb in terms of convincing a jury. Since you’re on the subject of bad ideas, another bad idea is indulging in divisive categorization of road users into, for example ‘cyclist’s and ‘carhead’, as you have done. As you’ve used those two category names, they carry about the same meaning, despite your most likely intending that the former of the two be considered ‘the good guys’…which they’re not if they’re using disparaging names to refer to people that drive. On the road, don’t unnecessarily and obnoxiously touch other people’s vehicle whether it’s a bike or a motor vehicle. If you goofed up in traffic, complicating things for other road users, would you like it if one of them got out of their motor vehicle, came over and slapped the side of your wheel with an open hand or fist? Kind of doubt you would. Oh, “cyclist” is a divisive term now? Get effing real. As someone who lived in Chicago, I can say that this is standard for Chicago Police. I was once assaulted by a cab driver, only to have the police argue with me that, no, I wasn’t actually assaulted. I was also pulled over on my bike for yelling at a driver that nearly ran me over and shouted death threats at me. Chicago is a very hostile city to people riding bikes. I’m having a hard time believing that the technology itself is racist. But I really don’t think a CCD sensor, an IR illuminator and a millimeter wave radar system are capable of the sentient thought required to be biased. The cameras don’t issue the tickets, the photo’s get reviewed. Still a human making the ultimate decision. Yes this is a key point I was thinking too. But this does reveal that minority drivers are disproportionately running red lights. And that’s what people who argue against bogus disparate claims – minorities are incacerated at higher rates than their share of the population because they’re disproportionately involved in crime. This red light camera study reveals that by a large margin, minorities are running red lights are a far disproportionate rate than whites. And this is an explanatory factor into why there are a disproportionately higher rate of minority traffic stops. What you’re now suggesting is that there is a screening process to determine which drivers are issued citations and whether more white camera shots are tossed relative to minorities which would indicate racial bias. This study doesn’t address this, of course, but can we cool it with the all-the-time, always-suggesting-that-police-are-bigots meme, please? It would be nice if human behavior was a nice bell curve, but it is not. This fact applies to traffic stops as well as crime as well as education. We need to abandon this senseless belief that there should be equal outcomes in employment, police stops, education, etc. Humans are not robots. No, this reveals the pitfalls of statistical analysis by non-statisticians. () Neighborhood placement – if the red light cameras are placed in neighborhoods that are predominantly not-white you would reasonably expect that to skew results. This is easy to predict without conscious bias. More affluent/rich/WHITE neighborhoods have more free time to randomly visit community government public meetings and loudly object to red light cameras in their neighborhoods. Minorities that are poor are too busy working multiple shifts to afford the copious free time needed to attend most if any of these meetings. This mechanism alone will put more red light cameras in minority neighborhoods. () demographics of all drivers – you may not have noticed as a new poster here but above and beyond Portland’s pasty WHITE demographic skew bicycle riders in general skew even more towards white. More WHITE people in America bicycle than any other race. When it comes to peak public transportation times I’d venture that a larger proportion of riders are going to be affluent/rich/WHITE people that can afford to waste their time on a slow form of transportation. Yes, the poor that can’t afford a car will take the bus too but all too often they won’t be able to get a job to go to without a car. Most will get a ride from friends or family. This means that for 1,000 minority employees and 1,000 WHITE employees more minorities will be driving to work than WHITE people. () demographics of drivers to shift work at non-“9 to 5” jobs – in rush hour it is rather difficult to run a red light due to the slow moving crush of vehicles in every direction. You could when you get to the light but in addition to witnesses at every corner daylight makes identifying you to police easy. OTOH in light traffic and off hours poor lighting and few witnesses encourage this law breaking. Who is out at all hours of the day but needs urgently to rush there? Minorities that disproportionately staff night and graveyard shifts at companies that see them as a disposable labor commodity doing work that WHITE people refuse to do. If they are late once they may lose the job. () bias in human review of red light camera footage – this is self explanatory. In essence the article in question is a showcase of faulty mathematics that will be showcased on Faux Nuws as “PROOF POSITIVE” of the racial superiority of WHITE people. Wow, so not only are the authors intent on demonstrating racial superiority, but Fox News is in the business of also demonstrating racial superiority? Really? After a thorough analysis, this is your takeaway? You’ve made a few posts now on different threads that sound — and I’m sure it’s not your intent — really racist. When called on them you’ve tended to double down. It might be time for a little introspection. Wow, my posts “sound racist”? Why do you say that? What, specifically, gives you the impression that I am racist? It can’t be that you merely disagree with my comments. My comment above that you replied to certainly does not reflect racism. Merely observing indisputable facts is not racist. Notice that I didn’t imply or suggest that minorities are simply more inclined to commit crime or run red lights. I observed that a disproportionate number commit crime and, based on this study, run red lights. Those are indisputable facts and citing them is not racist. You must know by now that with any hint of conservatism in your post you will earn the label of racist, homophobe and bigot regardless of any sense that you may make. If you mention Fox News then all bets are off and you should be prepared for the worst! Ask me how I know! But yeah, totally indisputable and not racist. To claim that non white people commit more crimes than white people is patently completely and obviously racist. You can claim that “minorities” wind up in jail more, and that’s fine. You can claim that they get arrested more, and that’s fine. You can even claim that their communities suffer from criminal acts more, and that’s fine. But you simply can not claim that they as people commit more crimes without being baldly and blatantly racist. 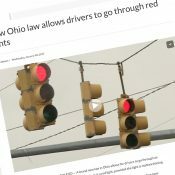 What they would need is a study that simply counted every driver (and their race) running the red light or not and then compared demographics of the people running lights to the people not running lights. I don’t buy that the reviewers are the problem. It wouldn’t address your 9-5 phenomenon. But those people are still breaking the law even if their circumstances are different. “Minorities” fill the jails because of racist law enforcement. Along with disproportionate prison term sentencing and the laws which put emphasis on crimes committed by the poor. Not because they commit more crimes. Criminal behavior is the same across the board when it comes to ethnicity – obviously. It is completely racist to say otherwise, actually. Racist law enforcement? Right, because all lae enforcement officials are bigots just lying in wait to stop and arrest minorities. Puhlease. KISS principle, please. Rather than concocting this false mass racism philosophy to explain disproportionate minority crime, accept the fact minorities simply cimmit a disproportionate level of crime. I remember in the 80s that the explanation eas poverty caused this disproportionate crime. Now it’s racist policing…. Okay, I guess. I never said police were bigots, but then again they are human, and do have biases like anyone else. All I pointed out was that the tickets are not issued because a photo was taken. There is still a review to determine if the photo can be used to uphold the charge. I know of two instances where I have triggered the camera and neither of which I have received a ticket for. Both were cases where I was legally making a right turn on red. Someone had to review those photos and say, well they are turning right so it is difficult for us to determine if they actually ran the light, and we wouldn’t win if they contest it. While I wad replying to your comment, my point about calling officers bigots was not aimed at you. Sorry for the confusion. Are red light camera citations human reviewed in all US states, counties and municipalities? I’d bet most do but the number can’t be 100% unless there is some federal law. I think I would have heard the ruckus such a law would have kicked up. The painting of the adhoc police parking stalls over the bike lane is only shocking if you have never walked around NYC police stations. The NYPD has historically been notorious about parking official vehicles on sidewalks over the last 20 years or so long before the Bloomberg bike lanes appeared. Linking this to a successful Vision Zero campaign is critical… but as we all know there is no Federal or State mandate for traffic safety (in practice). Does not say that Seattle’s all age helmet use law has reduced use of that city’s bike share system. Was Seattle’s mandatory all age bike helmet use law put in effect, against Seattle residents’ wishes? If Seattle residents desire helmet use to be a condition of riding bikes, then their mandatory bike helmet use law may not be reducing bike riding in the city. I got lost somewhere in your reasoning. If a majority of the population, or their representatives, supports mandatory helmet laws in spite of or perhaps because of the fact that mandatory helmet laws reduce the number of cyclists, then how is that okay? Let’s bear in mind that the number of people who ride bikes is a woefully small percentage of the population and is not universally liked. I daresay most Americans would like to ban cycling altogether, or at least from “their” roads. If Seattle’s all age mandatory bike helmet use law is supported by a majority of Seattle voters, and a majority of people that like to ride bikes in the city, want to do so with the protection of a bike helmet…then that law is not really obliging the voters do something they don’t want to do. Seattle’s bike share supporters and operators, if they’re not already, should be actively working to somehow, from people that bike in the city, get a sense of how important it is to them to be wearing a bike helmet when they ride a bike share bike. Recently to a bikeportland story comment section, someone involved in Seattle’s bike share program, posted a comment reporting that the bike share helmet vending system is working fairly well. Seems to me personally that Seattle and other cities with bike share systems could do better with a 16 and under, bike helmet use law. Though that still gets back to the basic question of: if people simply don’t want to ride the bikes unless there’s bike helmets available for them to use for a bit of head protection, and not simply because the city has a mandatory bike helmet use law…then that law may not be negatively effecting bike share use as some people seem inclined to presume. Well, what do you know? Traffic cameras are as racually bigoted as pokoce officers. I love the Dan Savage article! His experience and write-up perfectly illustrates how I feel whenever I see Portland propose these 2-way cycletracks (with 4′ lanes) one one side of street. Too narrow, too slow! I hope Portland can find a way to welcome the 8-80 set on to our streets without creating such limited infrastructure that we will all be biking at a snail’s pace. I also get that I (and other fast bikes) need to chill out and give people some space, something I am happy to do occasionally but I am not at all excited about doing regularly. Yeah, 4ft lanes are lame. It’s especially maddening when bike lanes are between curbs more than an inch high so you can’t really ride to the edge like on Dutch paths which have that short 45º angle edge. A serious, bi-directional cycle track, part of a very basic cycle track system, I think should be 20′ wide…10′ for each direction would allow decent passing room. 4′ wide lanes barely cut it…they’re often not much better than the little bit of roadway edge past the fog line. MaxD and wsbob, agreed — but has Portland proposed any 8′ bidirectionals lately? The need for 4′ lanes was the reason no bidirectional was recommended on 28th Avenue. 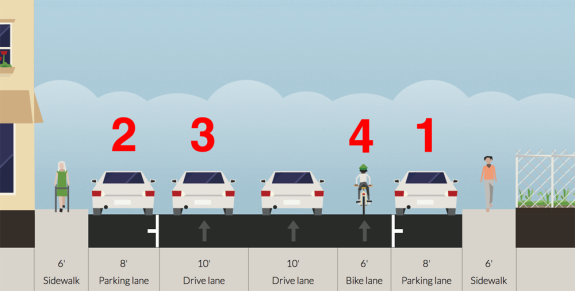 I’m not aware of any other projects considering 8′ bidirectional bike lanes, but I could be wrong. How wide is the bidirectional one used for the NE Going transition across NE 33rd? 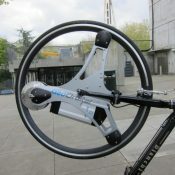 I have seen the idea floated for the “Green Loop” concept to be used along SE 7th Ave.
From the Boring Biking article. A nice and graphic description of the main reason simply importing ideas from other countries may not work here: *culture*. I don’t know… haven’t we always argued that for bicycle use to take off riding your bike on public roads needs to be boring? Besides, if having a lot of bicycle traffic is enough to dissuade bicycle commuters why do we still have so much onerous automobile traffic? 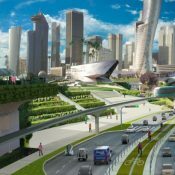 We have so much onerous automobile traffic because people are sadly and pathetically addicted to the automobile, and won’t or can’t live near where they work. Also they keep moving to Portland with their damn cars. The sidewalk priority thing should be copied wholesale from Seattle! It drives me nuts to see sidewalks closed in Portland for months on end while the all-important parking lanes are left untouched. And very rarely do people actually cross the street like they are instructed to do. Most people just walk in the travel lane, around the sidewalk closure. PBOT should accept that as the standard behavior and allow people to walk in the street by creating a safe space for them to do so. At minimum, I’ve always thought, is that if the sidewalk is to be taken up by a construction zone, then the parking lane should be coned off to make room for the pedestrians that are displaced by the closure. And the closed sidewalk is often not being used 90+% of the time. The developers just don’t care, so the city needs to make them care. The main issue with closes sidewalks or any part of traffic is price. Often cities charge way to little. Start charging 20 times whatever it costs to close a car lane and developers will find a way. Unfortunately the reality in seattle is that there are currently dozens of construction projects in a tiny area that are closing sidewalks, bike lanes and full traffic lanes anyway. There is no sidewalk priority, only build build build. Seattle, Seattle, Seattle, Seattle, Seattle… although I agree with the gist if not tone of what Dan Savage is saying. Bicycling simply doesn’t mean the same thing in Munich as it does in Portland (or much anywhere else in the US). Leisurely cycle tracks aren’t going to cut it in the year 2050 when you’ve got to go downtown from your apartment in rapidly-gentrifying Rockwood (because everything up to Montavilla rents for more than your monthly income). MAX will still be serving just a third of the population at half the speed of Munich’s U-Bahn. Looks like you’ll be pooling with somebody in a self-driving Uber. Yes, lots of Seattle news this week! I suspect that by 2050 “downtown” will include quite a bit of SE Portland up to 82nd. I for one would welcome boring biking. At least I’d be able to get more places, safely. *There were stories about people commuting by plane from Las Vegas to SF a decade ago during the previous run-up of housing prices in the Bay Area. However, for every person doing that, there’s hundreds of thousands who bought houses in the Central Valley and drive several hours every morning and evening to their Bay Area jobs. Ugh! A friend of mine did that until all that driving caused his health to get so bad he had to find a way to retire or else die. Observing facts is not racist. Or, as we have with concepts like the Holocaust, completely neutered what racism means? You do realize that racism is a belief, right? So, please do explain, how observing facts is racist. I am sick of people trying to shut down discourse simply because they don’t want to believe something to be true. That is what you’re doing here. You don’t want to believe that minorities commit disproportionate levels of crime, so you shout down anyone who observes this fact as a racist. Observing that minorities commit disproportionate levels of crime does not mean that blacks or hispanics or other minority groups are racially inferior. You do get this, right? Whites are disproportionately involved in mass killings. Indisputable. Am I now saying that whites are racially inferior? Of course not. Please stop trying to shut down debate because you either can’t handle truths or don’t want to accept truths.